Stand out this fourth of July with our Red, White & Blue Patriotic and Personalized Grandma Gifts and more. Grandma, Grandpa, Mom or Dad can show off the entire family on this attractive Custom Printed American Pride Shirt. A great patriotic gift anyone in the family would love to wear. Your Personalized 4th of July Shirt is available on our premium white 100% cotton T-Shirt, machine washable in adult sizes S-3XL. 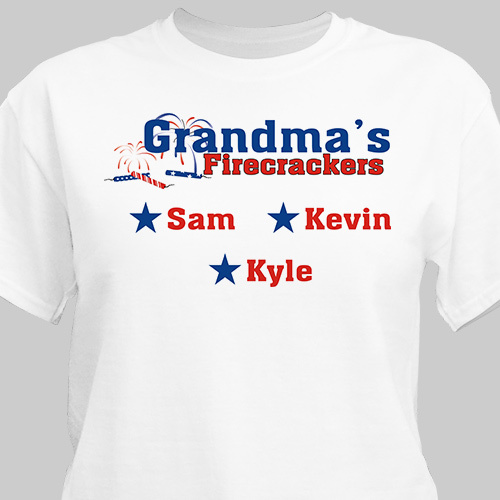 Our Personalized Firecracker shirt is also available in Ash Gray and Pink. Each Personalized 4th of July Gift includes free personalization. Personalized Patriotic Shirts can be customized with any title and up to 30 children or grandchildren’s names. Our Patriotic Clothing can have any custom title: Grandpa, Mom, Papa, Aunt Betty, Dad or any special title. Looking forward to wearing it for the red,white & blue holidays! GiftsForYouNow.com has many Personalized Military Gifts for your favorite Soldiers. Select any of our Best Selling Patriotic Gifts today and we will personalize it for FREE. GiftsForYouNow.com also has a wide array of Personalized Patriotic Gifts for the 4th of July, Memorial Day and Veteran's Day.